Written by Sooraj Sidhu, Workplace Advisor and Lindsay Carroll, Legal Practice Director, NRA Legal. 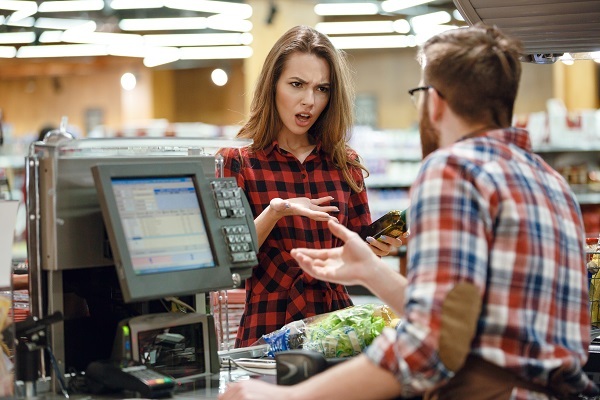 Customer misbehaviour, aggression and violence continues to be a challenge for employers and employees in the retail and fast food industries. Last year, the Shop Distributive and Allied Employees Association (SDA) shed light on this burgeoning issue, after revealing that 87% of workers surveyed had confessed to experiencing verbal abuse or aggressive behaviour from customers within the past 12 months. Unsurprisingly, these figures tend to spike around the festive season due to an increase in foot traffic, family tensions and alcohol consumption flowing into the work environment. However, reports on the shocking treatment of retail and fast food workers continue all year round, resulting in a push for employers of all sizes to review their business and determine new ways in which they can eliminate or mitigate the risks associated with customer violence. Dysfunctional customer behaviour encompasses a wide range of negative actions and words that have the effect of being dismissive, critical, rude, abrasive, crass, loud, intimidating, threatening or violent towards a worker. According to a recent report carried out by icare, the Menzies Health Institute of Queensland and SDA, such behaviour has become the norm in the retail industry rather than the exception, highlighting the pervasive and systemic nature of this issue. Businesses in hospitality are also vulnerable with many workers reporting daily occurrences of customer misbehaviour and being subject to online scrutiny and ridicule via uninvited video recordings. With that in mind, it is not hard to imagine how an exposure to aggressive customers can have a devastating impact on workers. In the worst case scenario, workers may grow accustomed to this sort of behaviour and fail to appreciate any impact it might be having on their health and safety. However, in addition to the more serious psychological and physical injuries, such treatment can also give rise to absences from work, underperformance and behavioural issues. In turn, these effects can create operational difficulties for the business as a result of workers compensation claims, increased insurance premiums, a higher turnover of staff and litigation. From a compliance perspective, employers have an obligation under work health and safety legislation to ensure that any threat to the health and safety of their workforce is eliminated or effectively minimised. Control measures are likely to be more effective where time is invested in understanding the causal factors contributing to dysfunctional customer behaviours. In the retail and hospitality industries, common causal factors include company policies and procedures, the service environment and wide-ranging customer motives such as esteem, revenge or financial goals. For example, in May 2018, a beach-goer took to the media after she was instructed by a security guard of the nearby Tangalooma Resort to swim elsewhere. In response to a written complaint by the beach-goer and in an attempt to remedy the situation, the Resort apologised for the way she might have felt but reasserted its right to move beach-goers who did not have a reservation at the resort or casual day pass. Unfortunately, the response went viral and the media frenzy that ensued caused immediate reputational damage for the resort, with many casual visitors to Moreton Island feeling emboldened to directly threaten the health and safety of staff. Recognising their fundamental obligation to workers, Tangalooma Resort was forced to reconsider its organisational policies and has since suspended the provision of casual day passes until further notice. Research has confirmed the danger for businesses in adopting the common ideology: “the customer is always right”. Over time, this approach has promoted an unequal balance of power between customers and employees, increasing the risk of injury. When carrying out a review of the company operations, employers are advised to take a holistic approach and balance its commercial objectives with the need for a safe work environment. For example, you may be able to mitigate the impacts of customer violence by engaging in regular consultation with your employees and providing greater flexibility for victims of abuse. drafting customer aggression or workplace violence prevention policies and procedures. To find out more information, contact one of our dedicate workplace relations specialists on 1800 RETAIL (738 245).